Copyright © Take Note! Designs. Images used with permission. 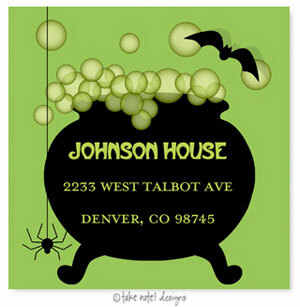 Send out Halloween Invitations in style with these absolutely wonderful Halloween Invitations. Card prices include DOUBLE SIDE PRINTED, with full color design on the back, no more plain white backs! Since these invitations are printed on demand, you have the ability to change ANY of the text shown on the sample card. Cards are digitally printed on 120# white heavy card stock. Metropolitaines and Mrs Eaves All Caps shown. Choose up to 2 typestyles and dictate where they are used. 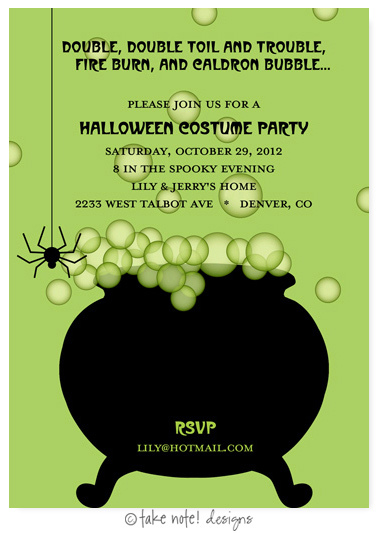 Customized self-adhesive matte labels which coordinate with your Halloween Invitations are available for an additional fee. White square back envelopes are included with your card. Your return address may be printed on the back flap of the envelope in your choice of typestyle and ink color for an additional fee. Typestyle(s) Used: Metropolitaines and Mrs Eaves All Caps. If applicable, where should Typestyle #1 be used?